In some of my previous posts, I've mentioned that I've gotten things for my house from a local gem show but I've never really explained what the show is. 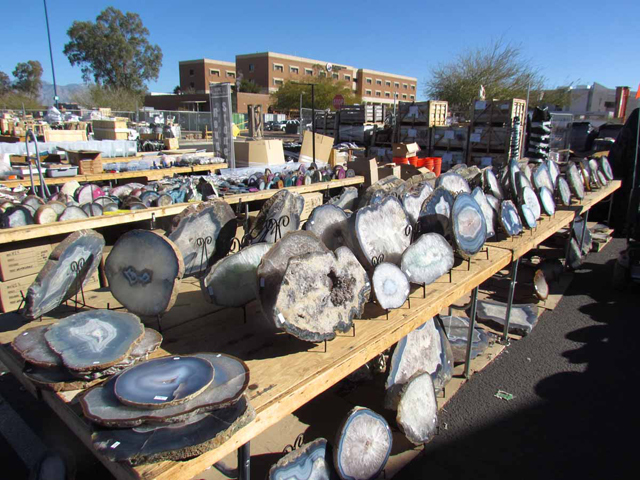 Basically, hundreds of vendors from across the country make the trek out to Tucson to set up tents inside and outside of the TCC Convention Center to sell their goods to thousands of attendees over a two week period. The show is open to the public but a lot of the booths/tents are open to wholesalers only. 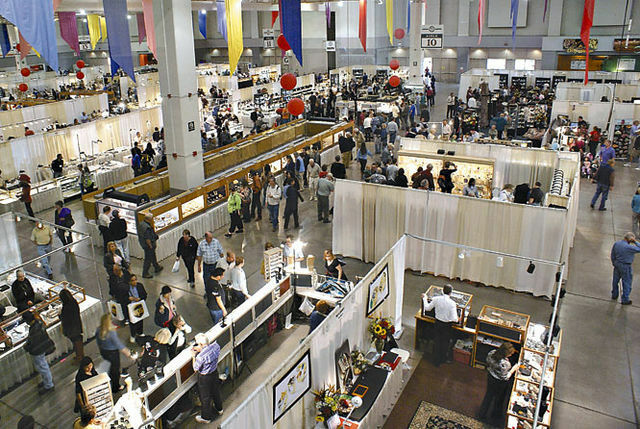 For the non-wholesalers, there's lots of expensive jewelry and loose gems out on display along with a ton of cool mineral and fossil exhibits. If you're a local, you know to head to the show during one of the last weekends because by that point, the vendors are so desperate to get rid of their merchandise (so they don't have to haul it back home with them) that they mark everything 50% off or more! 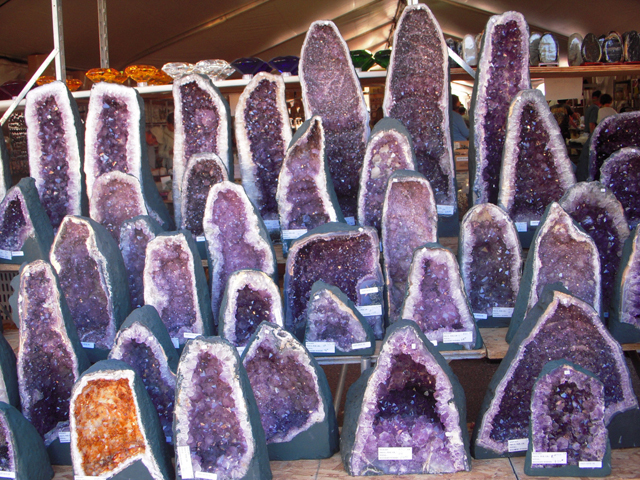 There's a special section of the show that my mom and I like to spend most of our time in because they have tons of rocks and minerals on sale for dirt cheap. 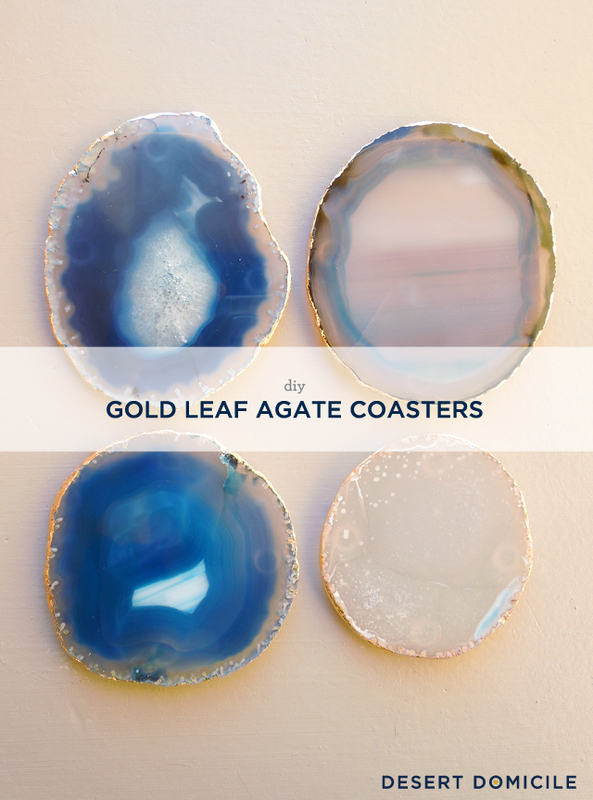 Remember the agate slices I made into coasters? I think I paid between $1 - $2 per slice which is crazy considering Uncommon Goods is selling a set of 4 coasters for $64. If you didn't want to go the coaster route, you could always DIY an agate slice pendant like Tanya at Dans Le Townhouse did! 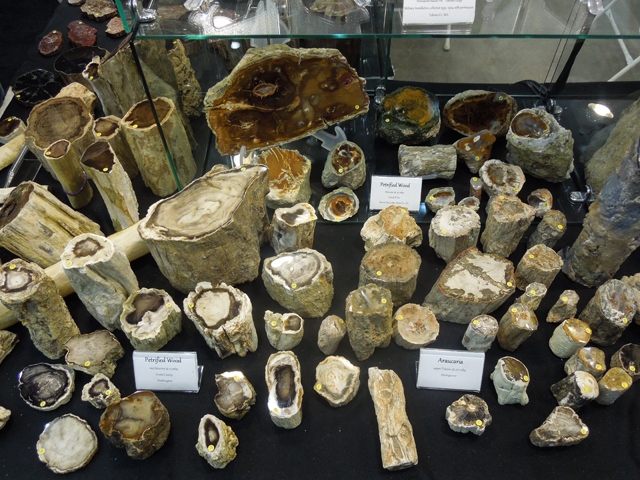 Some of the vendors at the show also sell agate bookends for dirt cheap. I'm talking maybe $10 - $15 for the set. I was at HomeGoods over the weekend and I saw a set selling for $30! That's not bad but not good considering I can get two sets for the price of one of theirs. See those larger slices in the front of the photo? You could stand them up on display like they're shown or you could use them as a cheese platter or even a trivet! They run anywhere from $15 - $50 depending on their size and thickness. Those tend to be on the pricier side but small ones run around $150 - $200 if I'm remembering right. I've seen some humongous ones in the $1,000 price range though! You probably can't see the price tag in the photo above but if you look at the large image on Wikimedia, you'll see that the large piece of petrified wood that's sitting on the table is only $110! That's not bad for such a huge piece! So what am I trying to get at? 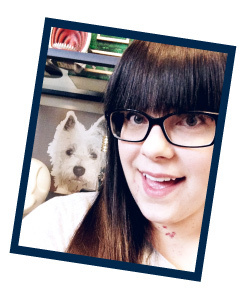 Well, because everything is so cheap, I'm planning on buying something to giveaway on my blog after the show is over! I was thinking a set of agate bookends since they're hot in the decor world but maybe you'd like something else? Maybe some agate slices? I actually had been wondering what the gem show was when you made those beautiful coasters. That sounds SO fun! Bookends = yes. I'm thinking about request some slices to make coasters. Do you think shipping would be much? It shouldn't be! I can probably fit them into a bubble envelope or a Priority Mail one. What colors would you be interested in? I want to go to there. I absolutely love those coasters you made. I may put in a request for some slices. Remind me when you plan on going! Seriously. I would love a blue slice for around $15-20. You are awesome to take orders!